An evening under the stars. The hall was beautifully decorated with faerie lights criss-crossing the ceiling, stylish tables and an air of celebration. Elegantly dressed guests were welcomed by a fire-dancer, saxophonist and Lanique cocktails. 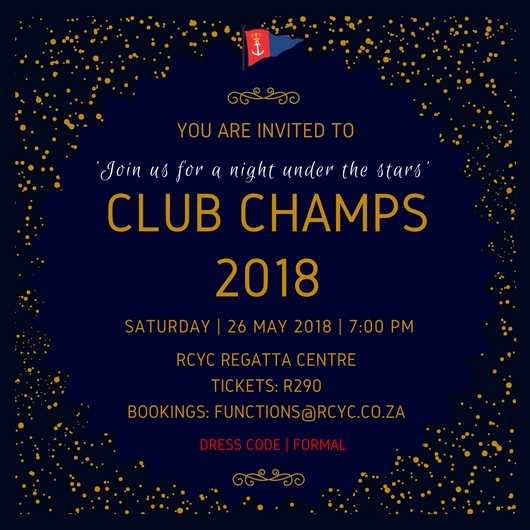 The annual club dinner is more than just a prize giving ceremony. It is a chance to reflect on the recent sailing season, to celebrate our club and enjoy time with fellow members who share the same passion for spending time on the water. Joep Schoof and Andrew Collins were the Masters of Ceremonies for the evening. They began by looking back at some of the more notable events of the last year. The Volvo round the world stop-over in Cape Town, the launch and rapid growth of the Cape 31 fleet, the introduction of the SV14 for disabled and abled sailors, as well as some of the exploits of the cruising fleet. Commodore Vitor Medina presented a very special blazer to Lindani Mchunu, the head of our Sailing Academy. The magnificent RCYC wire badge had been sent to the club by a previous member now living in New Zealand, who wanted it to be given to someone truly deserving. Lindani has been a breath of fresh air at RCYC. He has embraced the Academy, developed a vision and enacting that vision. His love for the kids and his desire to help them achieve as much as they can in life, is palpable. Lindani spoke eloquently and emotionally about where he had come from and the privilege he has experienced in his life. He spoke about how he wants to try and give the Academy kids a little of that privilege through their involvement with RCYC. It was a speech that made a deep impression on those of us at the dinner. The girls from the Academy had each made a huge effort with their outfits and they all looked spectacular. The formal part of the evening concluded with the presentation of the special awards and the club championships. These awards include the Female Sailor of the Year (Heidi Burger), International Sailor of the Year (Alex Burger) and Male Sailor of the Year (Bernard Farmer). They are won largely by those members of the club who sail regularly and support the club in most of our events. Once the formal proceedings were over, the band, Tuxedo, had everyone out of their seats and displaying varying degrees of skill on the dance floor. The Sailing office and the Functions department are to be thanked for their efforts in ensuring the success of the evening. Our chefs and Inside House staff delivered a delicious dinner to the 180 guests.